Bangbao village is in the southwestern corner of Koh Chang. The peninsula, which until a few years ago was undeveloped, shelters the village from the rainy season storms. Thus making it the ideal location for fishermen to live. Many people skip visiting the peninsula, but there is a rough dirt road down it which affords some great views across the bay. And at the far southern tip you can walk to a small shrine for the Thai sailors who lost their life in the WW2 Battle of Koh Chang. The other highlights are a stroll along the pier in the fishing village which still possesses some charm – although now is mostly souvenir shops. And the views from the end of the pier across the bay, which are very impressive. A kilometres from Bangbao lies Klong Kloi beach. This was also undeveloped a decade ago but is now home to a growing number of small beach restaurants and resorts and has a very laid back vibe. It’s a good spot for a day trip. 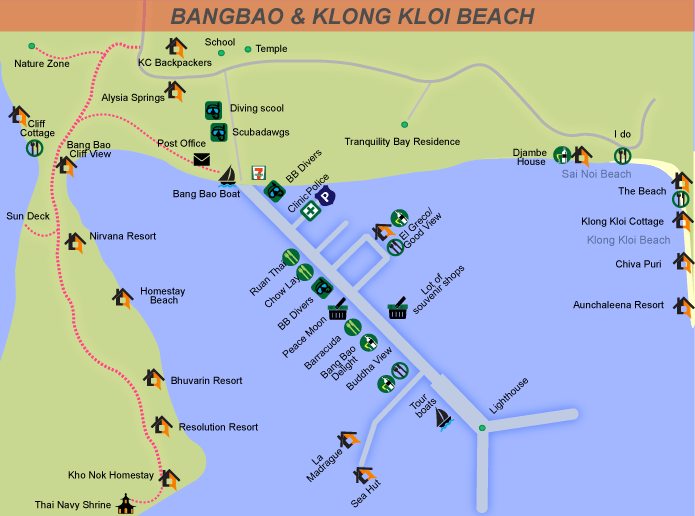 Until mid 2009 Google didn’t have this area of Koh Chang in good enough resolution to make a good map, it was all just a blur. But now they have sent their satellites over and so it is possible to get more info on the area and plan a trip here using Googlemaps. For detailed information on the many and varied attractions of Bangbao, ie. good seafood restaurants, reliable dive operators, great value souvenir shops or rip-off seafood restaurants and dive operators, and over priced tourist junk – depending on your personal opinion, see the this page in the Island Guide section. If you’d prefer to just look at some more pictures then check out the Photo Gallery.